Unfortunately, Revi placed the word “pressed” in parentheses after the word “shaped” in his version of this quotation, which he gives on p. 39 of his book. In fact, at the time this trademark was registered blanks were usually produced by blowing a gather of hot glass into a mold (for shape and size) rather than by pressing. “Shaped blanks” means simply that the company would be using the trademark on blanks of various shapes, such as bowls, nappies, plates. etc. This is confirmed by adverising copy where the trademark is shown and described as a “small star within [a] circle.” The advertisement goes on to state that “From April 1st, 1901, on every article of plain metal [i.e., a plain, or smooth, glass blank] sold by us for cutting we will stamp our copyrighted trade-mark …” And further: “Buyers of cut glass can be assured of our blanks only when the goods carry this mark [acid] etched on every piece.” (note 1) The buyers in this case would have been the cutting shops that purchased the blanks from Libbey. Some cutting shops probably removed the Libbey trademark; others retained it. Interestingly, the registration application also indicates that the Libbey star-in-a-circle trademark, which “has been used by said company in its business since February 19, 1901”, could be used “on paper labels” as well as applied to glass “by stamping or etching.” To date no paper labels have been found; perhaps they were never used. In any case they would not have survived the cutting process. The complete application is given here as note 2. Later in his book Revi equates “pressed” blanks with “figured” blanks — and thus compounds his error. His comment on p. 469 concerning Libbey’s star-in-a-circle trademark is as follows: “for use on pressed (figured) blanks”. This is undoubtedly the source for the misinformation that has been repeated as gospel by enthusiasts of cut glass for more than thirty years. The story is told here in detail, not as a criticism of A. C. Revi, whose work is widely admired, but as an example of the half-truths and myths this Website wishes to eradicate. From the foregoing it is clear that the Libbey star-in-a-circle trademark was acid-etched on plain blanks. The writer has seen several examples of this trademark but never on a “figured” blank. The fact that Libbey did use “figured” blanks has been mentioned earlier, and the reader can find more on this important subject in the blanks.htm file in Part 1. Here it is important to emphasize that there is no connection between the Libbey star-in-a-circle trademark and the company’s “figured” blanks. The star-in-a-circle story is not yet complete, however. Imaginative dealers and collectors have, for many years, associated it with L. Straus & Sons, presumably only because of its similarity to a paper label used by Straus. Craig Carlson, who supplied much of the information used in the above account, is presently compiling a history of the trademark(s) used by the Straus company. It is hoped that his work will resolve this matter once and for all. To date he has found nothing to contradict the foregoing material. 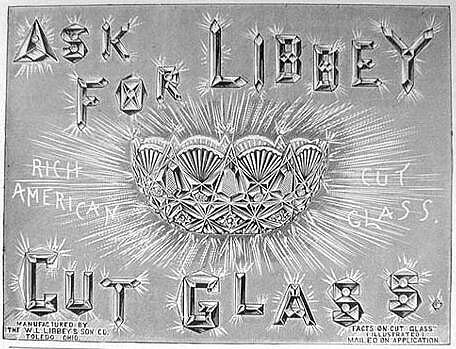 Be it known that THE LIBBEY GLASS CO., a corporation organized under the laws of the State of Ohio, and doing business in the city of Toledo, county of Lucas, in said State, has adopted for its use a Trade-Mark for Glass, of which the following is a full, clear, and exact specification. The said trade-mark consists of the representation of a star inclosed within a circle. 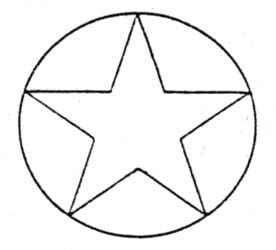 This has generally been arranged as shown in the accompanying facsimile, where the star is shown as having its points in contact with the circle. The figures may be arranged and combined in a different manner than as set forth and may be represented in various colors without materially changing the character of the mark, the essential feature of which is the representation of a star inclosed within a circle. This trade-mark has been continuously used by said corporation in its business since February 19, 1901. The class of merchandise to which this trade-mark is appropriated is glass, and the particular description of goods comprised in such class upon which it is used is shaped blanks intended to be made into cut-glass articles. It has been the practice to apply the trade-mark to the articles by stamping or etching it thereon or by means of labels bearing the mark and placed upon the article, and the mark is also used by said corporation in advertising and is otherwise dislayed in the manner customary in the trade. JEFFERSON D. ROBINSON, being duly sworn, deposes and says, that he is the secretary of the corporation, the applicant named in the application for registration of trade-mark: that he verily believes that the statement therein contained is true; that said corporation has at this time a right to the use of the trade-mark therein described; that no other person, firm or corporation has the right to such use, either in the identical form or any such near resemblance thereto as might be calculated to deceive; that it is used by said corporation in commerce between the United States and foreign nations or Indian tribes, and particularly with the Dominion of Canada, and that the description and facsimile presented for record truly represent the trade-mark sought to be registered. Subscribed and sworn to before me, the undersigned, this 7th day of March, 1901. Shape name (can be generic); shape number from the official catalogs of the Libbey company; pattern name (if known); cutting shop associated with this pattern; and any other acid-etched trademark found on the item. In addition it is important to note whether the item has been cut on a plain or a “figured” blank. The item’s dimensions and weight should also be reported, together with any references to previously published accounts of the item. In return for this co-operation the reader will have the satisfaction of contributing to the resolution of a major uncertainty in American cut glass. Evidence that contradicts the writer’s suppositions — for example, that the star-in-a-circle trademark is found only on items that have been cut on plain blanks — will also be reported. Readers will almost certainly come across genuine items from L. Straus & Sons that carry this trademark. It would be surprising if this cutting shop did not buy blanks from the Libbey company from time-to-time after 1900. The list of patented patterns in this file is largely based on the J. Stanley Brothers, Jr. volumes of patent material in the Rakow library of the Corning Museum of Glass as well as the U. S. Patent and Trademark Office’s Web site. A composite catalog, assembled and reprinted in 1996 by the Toledo Museum of Art and the American Cut Glass Association, and the earlier work by Revi (1965, pp. 48-61) were also useful. All patents were assigned by their patentees to the company, except those marked with an asterisk (*). These patents were retained by their patentees. 1. The official name for patent no. 24,875 is Gem. The Roman numeral has been added here in order to distinguish this pattern from a later one also named Gem. 2. The drawing that was submitted with the patent application for no. 36,276 is shown below, left (from Revi 1965, p. 35). It seems unlikely, for aesthetic reasons, that the designer intended that all of the “ornamental bars” be used on a single piece of cut glass, and, in fact, no such item has come to light. The patent’s specification is unclear on this point. It merely enumerates several different ornamental bars (five of which are illustrated here). The designer’s intention probably was to suggest various motifs that could be used. The “Ornamental Bars” pattern does not appear in any reprinted Libbey catalog. It shares this fate with a number of Libbey patterns. For example, patent nos. 36,277 and 36,278 — the Morello and 1903 patterns respectively — are included in this group. They were identified several years ago only after contemporary magazine advertisements, placed by the Libbey company, were discovered. The vase on the right, shape no. 292, is assumed to be cut in the “Ornamental Bars” pattern. However, this pattern is shown on a tray in REFLECTIONS ON AMERICAN CUT GLASS by B. and L. Boggess as item no. 592, where it is said to be pattern No. 136. It has not been possible to confirm this identification. 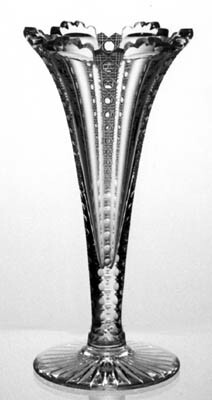 The vase is signed with the Libbey saber trademark. It is 8″ (20.3 cm) tall, weighs 1.25 lb (0.6 kg), and has a 36-pt star on its foot. The vase sold for $100 in 1988. 3. Neither the Fern pattern (c1908) nor the slightly later Star and Feather pattern (c1910) exactly duplicates pattern no. 38,000. While it is possible that a third, as yet undiscovered, pattern will give an exact match, most writers refer to no. 38,000 as Star and Feather. This writer believes that the Fern pattern is a closer match, however. Drawings that accompany patent applications are sometimes not realized exactly (see “Wicker” below), adding to the problem of pattern identification. 4. The patent drawing for the “Wicker” pattern shows no cutting within a chain of quadrilaterals that surrounds a central (basal) “fern” star. In practice these areas were cut. B. and L. Boggess have published a signed, but unidentified, Libbey tray in IDENTIFYING AMERICAN BRILLIANT CUT GLASS (item no. 628, p. 174) that is identical to one that was, at one time, in the writer’s inventory, where it was regarded as an example of the “Wicker” pattern. In these examples hobstars occupy the quadrilaterals. 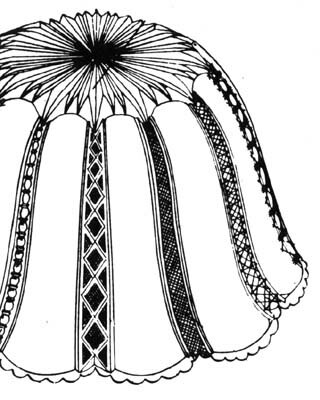 Unfortunately, the patent’s specification does not provide clarification: The pattern is not described verbally; it is only illustrated — without hobstars — as “a perspective view of a cut-glass dish [that shows] my new design” (illustration reproduced in Revi 1965, p. 35). A Libbey Advertisement Showing the Patented Florence Pattern, as Published in The Cosmopolitan, 1891.